New developments in captioning software mean that captions can now be outputted wirelessly to different devices such as LCD screens, projectors and tablets. If you would like to find out more about this software please contact Stagetext. There are two types of captioning: open and closed. In a theatre setting open captioning means that the captions are shown on screens visible to the whole audience. Generally Stagetext provides and promotes the use of open captioning because it makes the performance accessible to everyone in the audience and there is research to show that with open captions audiences spend more time looking at the actors. Stagetext has carried out some research among deaf, deafened and hard of hearing people on this subject. In terms of viewing the performance, hand-held and seat-back screens present the challenge of constantly having to adjust the focus of the eye from the screen to the stage and so it is not appropriate for accessing most theatre productions. Although Stagetext advocates the use of open captioning there are some circumstances where closed captions might be appropriate. 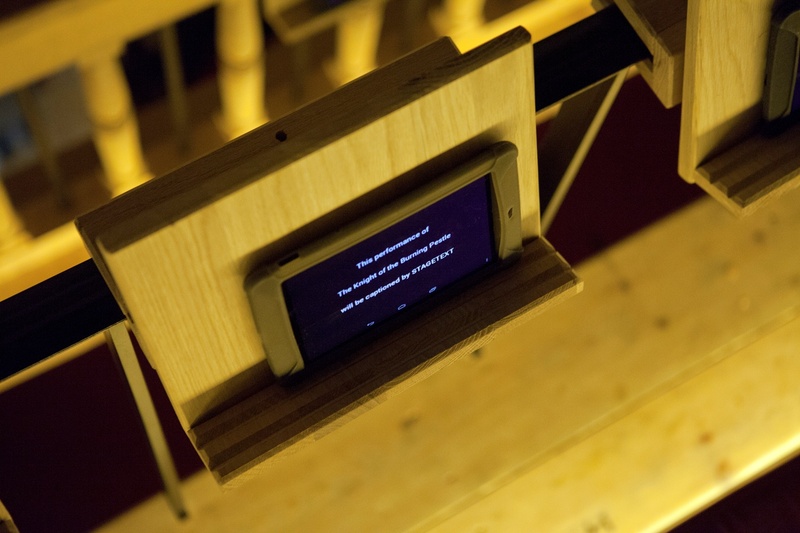 The use of tablets could be used for promenade theatre events, where the audience need to follow the actors, site-specific work or when the set design would obstruct a unit or people’s view of the unit. 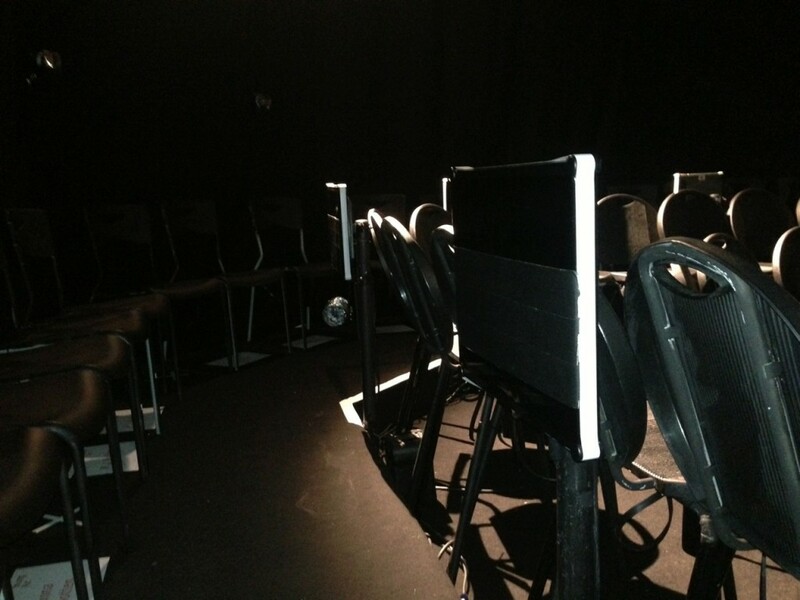 The use of tablets requires the audience member to collect the equipment or to be seated in front of the equipment. If patrons are forced to pick up a handheld device in order to access the captions, it would only be the people who feel happy to declare that they are deaf, deafened or hard of hearing who would benefit. Not everyone is familiar with tablets and comfortable using them. The placement of the tablets is an important consideration. To minimise the need for the audience to constantly adjust their gaze the audience should be seated on a higher level than the stage with the screens in front of them so they are able to look down at both the action and the screen. Tablets become heavy after holding them for a long period of time so a stand of some description (for example a music stand) should be considered or fitting the screen to the chairs in front. If your theatre is on an extremely tight budget and you already have access to an LCD screen or projector than it would be possible to use either of these pieces of equipment in much the same way as a caption unit is used. The typical television aspect ratio of 16 to 9 is quite different to the LED displays which are 6 to 1. On a letterbox shaped LED display, we can display about 40 characters per line, which means that a good amount of information or dialogue can be displayed on each line of text. When the display used is not letterbox-shaped, then fewer characters can be shown which means that the lines are shorter and they have to scroll more quickly to keep up with the dialogue. LCD or plasma displays are also not legible if any of the stage lighting hits them, which means that they may have to be placed further away from the action. There can frequently be a “glow” with LCD and plasma screens which may not work with a production’s aesthetic. LEDs are completely dark when not lit, so an LED display may seem more in keeping with a theatre’s ambiance. Small LCD screens used for Going Dark, Fuel. An LCD screen could be placed on the side of a stage in a small space and the captions could be outputted to the screen. The captions would be accessible to a proportion of the audience, depending on the size of the screen and the theatre, but it would not be completely open captioning as caption units are visible from a far greater distance. Small LCD screens could also be placed in certain areas of a theatre providing access to a handful of people at a time which would be closed captioning. Using a projector it is possible to project onto the back of the stage. 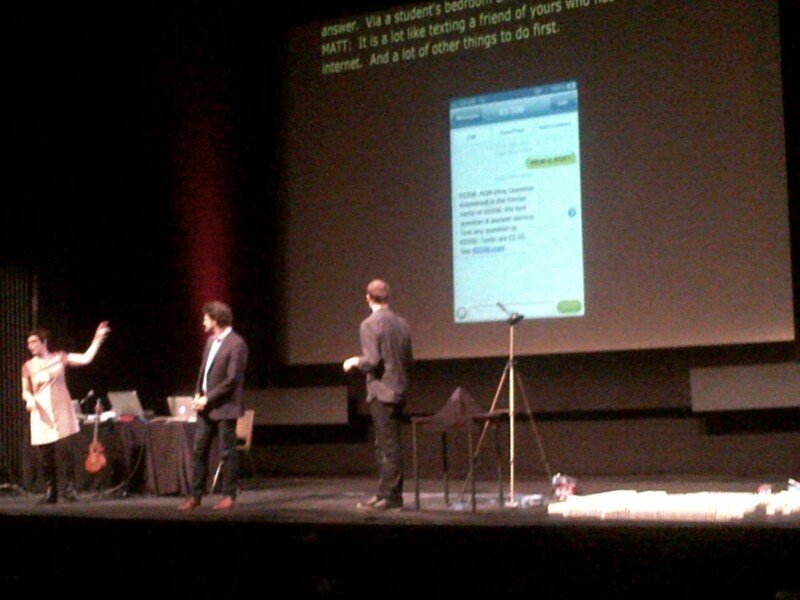 This worked well for The Festival of the Spoken Nerd’s show, Technobabble, in April 2014 at Bloomsbury Theatre. Although an option this solution is probably only suitable for a small number of shows where projections fit in with the aesthetic of the production. If you want to project the text from the lighting rig or the auditorium then it needs to make sure that the stage lighting won’t wash-out the text thereby compromising its legibility. If you want to back-project the text then they have to ensure that they either have enough depth between the projector and the back cloth to do this or a way of reflecting the text onto the cloth with a mirror. With the advent of ‘Smart glasses’ we’ve had some theatres and patrons contact us about their possible use for theatre access. Sony has trialled using their glasses for Cinema Access, and Stagetext have been in talks with them for trialling glasses for theatre captioning in the near future. If you feel a production in your theatre is unsuitable for open captioning please contact Stagetext and they would be happy to advise you further on open and closed captioning systems.